dispel that perception and list dos and don'ts for a career diplomats. Released recently by ex-diplomat and Vice President of India M Hamid Ansari, the book could be of help for non-diplomat globe-trotters as well. For young IFS probationers and aspiring diplomats, it’s more a guide-book. Budhwar’s book has hit the book stalls when the government has agreed to double the total strength of career diplomats to about 1,500, and the ministry of external affairs is pitching for even more to inch towards China’s statistics of over 6,000 diplomats. A 1962 batch Indian Foreign Service officer, Budhwar divides his time between Delhi and his cottage at Kumaon hills. In this internet age, Budhwar finds the hilly set-up of Kumaon an ideal location to research and write his fifth book. While releasing the book, Vice President Ansari said that younger IFS officers are in many ways brighter than the older lot. Yet, the nation requires diplomats having exceptional skills to meet today’s global challenges. Last week, ex-home secretary and current Governor of Sikkim Balmiki Prasad Singh presented a copy of his recent book named “Our India” written for school children. The book portrays his appreciation of India’s experience as a civilization and as a nation. Some of the perceptions are not incorrect as well. It is a wonderful book...I have read the book and I m trying to give a honest review. It is a book on what is the job like and not only about his personal life. 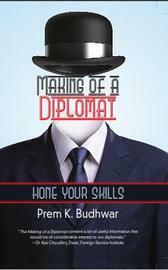 each chapter has detailed explanation on diplomacy,hospitality,protocol,wives,others. it does justice to some one wanting to know what kind of job skills and atmosphere diplomats work. it is worth a read if u considering a career in INDIAN FOREIGN SERVICE . thank-you sir for the book. There is astounding similarity of the cover with the book "Crimes Against Logic: Exposing the Bogus Arguments of Politicians, Priests, Journalists, and Other Serial Offenders".... A mere coincidence?